When you are having or have a baby there is so much choice available when it comes to what baby items to buy, especially when it comes to baby monitors. There are so many different makes and models on the market all with different features. As I am a bit, a lot of a worrier I have always wanted monitors that detect baby's breathing as I am forever up checking on my children multiple times during the night. I had heard of so many people that their monitors kept going off for no reason during the night worrying them. So, in the end, I did not buy any and just brought normal monitors instead which turned out to be a bit rubbish if I am honest as they were really crackly. However, a few week's ago I was very lucky to be selected to be a tester for Babies R Us and they sent me some new baby monitor's to try out that had babysense movement monitors included. This was perfect for me being a mum to a one-year-old and a newborn. We were sent the Motorola MBP16 baby monitor and Babysense bundle. 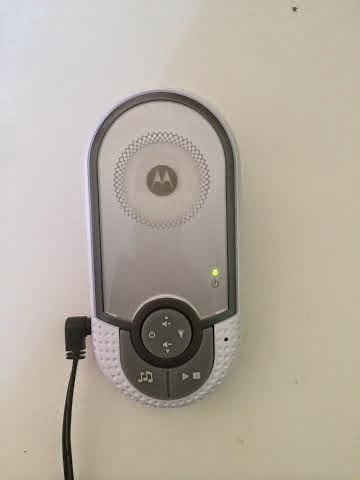 A bundle that includes Motorola baby monitors to hear the baby and a babysense sensor pad to place under baby's mattress to give you peace of mind that they are breathing when they are asleep. The baby monitor has a 300-meter range, so you can use it in any part of your house or garden as the parent unit is portable and includes data encryption to prevent any interference. It has backlit LED screen, built-in nightlight, and lullabies and a two-way talk as added features. The babysense sensor includes two highly sensitive sensor pads that monitor baby's breathing when they are asleep. If the baby stops breathing after 20 seconds a high pitch alarm will sound and it will also sound if less then 10 movements per minute detected. It is recommended for healthy babies up to one year of age. The box arrived and inside were two smaller boxes, one with the monitors in and the other with the babysense monitors in. We have been using them for a few week's now, every day to really test them out fully and we have found them so easy to use. They were both super easy and quick to set up with easy to follow, clear instructions included. With the baby monitors you literally plug them in to charge and turn them on and that's it they are ready to use. A little message will flash up on the screen telling you if they are not connected. I have been using the monitors with Sophia who is one year old and we use them when she goes to bed on a night time. We live very close to Newcastle airport and with our old monitors, we had interference due to this, with these monitors we have had no interference or crackling sounds at all. The sound quality is fantastic as I can hear every little noise that she makes so clear. The parent unit can be charged up and carried around with you so that you can hear baby anywhere you go in the house or garden. It also shows you the temperature in the baby's room so you can make sure they are not too hot or cold. And if you press a button you can talk to baby through the monitor if you wish, like a walkie-talkie. The baby unit also has some great extra features such as a built-in night light and it plays soothing lullabies at the touch of a button. 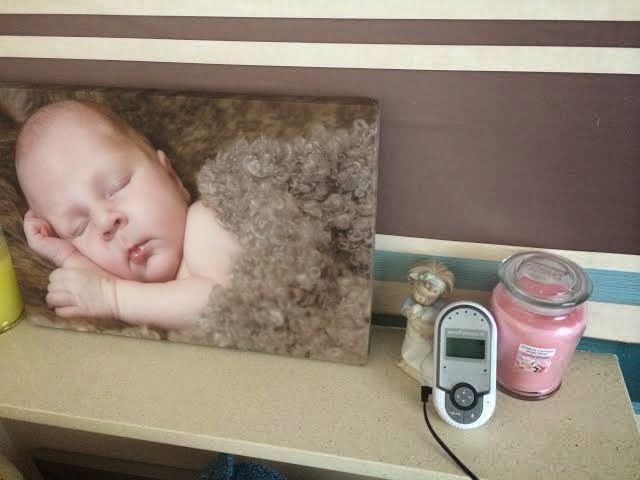 If the baby unit is not plugged in or is turned off by mistake the parent unit will beep and a message will flash up on the screen telling you that it is not connected, so you can be sure that the monitors are connected properly. They are brilliant we found them so easy to use with great sound quality and lots of useful extra features. We have been using the babysense monitor with Jacob for the last few week's as he is still a tiny baby who is with me all the time and sleeps in our room on a night time, so we don't need the monitors for him yet. But the Babysense sensors and the baby monitors would work great together when he is older. 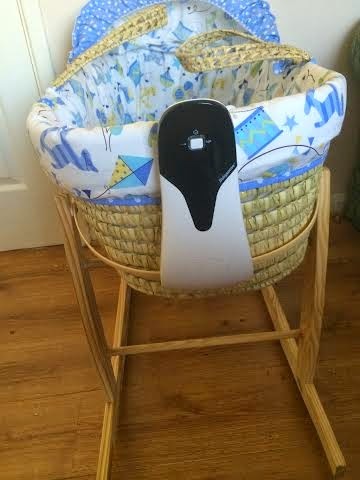 The Babysense sensors were again super easy and very quick to set up, we have been using it on a mosses basket and it fits perfectly, it can also be used on cribs and cots. Because Jacob is still so young we only use one of the pads supplied but once he is a bit older and is in a cot and moving around you use both pads supplied spaced out in the cot to detect movements better. 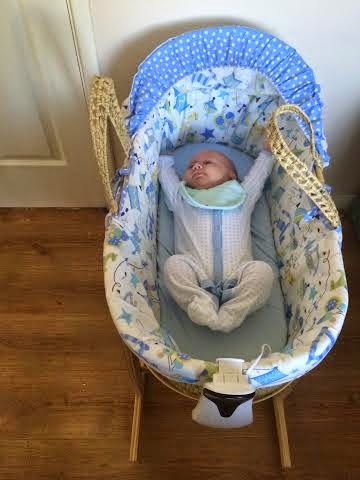 We placed the pad under his mattress and plugged it into the monitor and the monitor then clipped onto the end of his Moses basket. 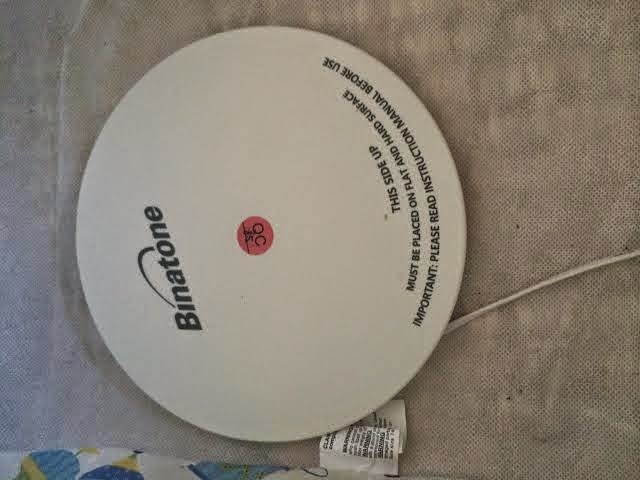 The monitor is battery operated and the batteries are included, so no wires plugged into the mains making it safer. Once the sensor is set up you just put the baby in the cot and press a button to turn the sensor on and a blue light will flash to let you know that its detecting breathing movements through the mattress. The sensor pads detect baby's breathing, if it detects no movements after 20 seconds then an alarm will sound which will wake you and baby up. We have not had any false alarms like people have mentioned with similar products, the only time I have heard the alarm sound was when I picked Jacob up and forgot to turn it off. This is a perfect product for someone like me who worries a lot about there children and is constantly waking up to check they are ok and still breathing during the night, as this reassures me that Jacob is okay and it also stops me disturbing him so much. * The parent unit is portable so can take it with you. 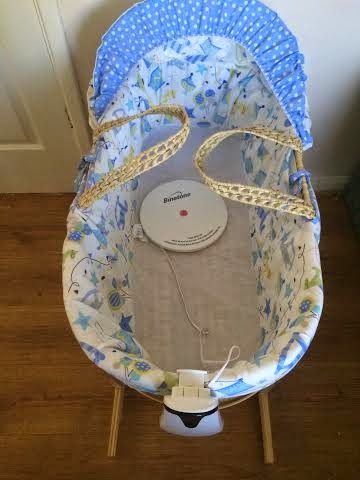 The babysense monitor which is attached to the cot flashes a blue light when in use and as Jacobs mosses basket is near my bed I could see it flashing all night and it was irritating. Would I recommend this product? Yes defiantly, it is expensive but I believe that you get what you pay for things like this, so it is defiantly worth the money. It is so easy to set up and use and I cannot fault it in any way as it is so much better than our old monitors. With clear sounds, no interference and lots of nice little useful extra features and the sensor pads are so reassuring for anxious parents. 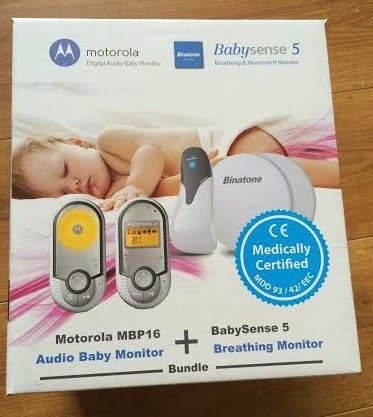 This Motorola MBP16 baby monitor and Babysense bundle is available to buy from Babies R Us and is priced at £99.99. * Disclosure: I was sent this product for free for the purpose of this review, however, I was not paid for this post and all opinions are my own. I've always been wary of the motion sensor monitors after a friend told me her's kept going off when it came unplugged! I think they've come on a bit since then though! Looks like a great product. Baby/child are is so important. Yet parents and carers need some sleep/rest time etc. Reassuring product.